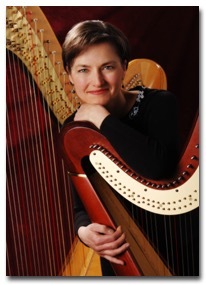 Wisconsin based harpist, Mary Keppeler, has been communicating through the elegance and grace of the harp since the age of eleven. Along with playing for weddings, receptions, private, corporate and charitable functions, she is a free-lance orchestra and ensemble harpist. She expresses clear, clean sounds through a resonant, restful, yet energizing music. Mixing classical, popular and folk arrangements, she creates music that can convey moods ranging from playfulness to quiet reflection or nostalgia to elegant wonder. For a list of songs Mary plays, visit her Playlist page.